"For the first time in nearly a decade we have halted parts of Iran's nuclear program" announced a jubilant Barack Obama after the news of the just-signed Geneva six-month interim agreement with Iran. But the American goal for the accord was that the Iranians not "advance their program" of building a uranium nuclear bomb (and perhaps a plutonium bomb too); the apparent deal exactly permits such advancement, plus sanctions relief to Tehran worth about US$9 billion. This wretched deal offers one occasion when comparison with Neville Chamberlain in Munich in 1938 is valid. An overeager Western government, blind to the evil cunning of the regime it so much wants to work with, appeases it with concessions that will come back to haunt it. Geneva & Nov. 24 will be remembered along with Munich & Sep. 29. The Geneva negotiators on Nov. 23. 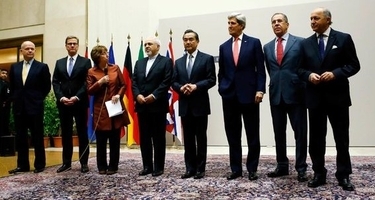 Note the Iranian foreign minister (the man without a tie) ceremonially placed at the center. Barack Obama has made many foreign policy errors in the past five years, but this is the first to rank as a disaster. Along with the health care law, it is one of his worst-ever steps. John Kerry is a too-eager puppy looking for a deal at any price. Nov. 30, 2013 update: Claims coming out of Iran suggest the amount the government will receive in gratitude for deigning to sign the Joint Plan of Action is US$15 billion in new revenues and US$8 billion in un-frozen assets, for a total of US$23 billion in all, far more than the US$9 billion I had estimated six days ago. Dec. 11, 2013 update: American officials have apparently acknowledged that this larger figure, around $20 billion, is the correct one. 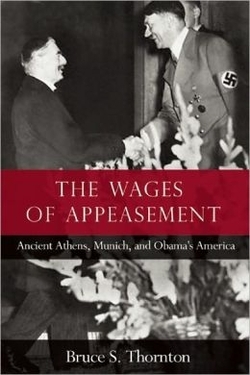 Jan. 9, 2014 update: Bruce Thornton of the Hoover Institution, author of The Wages of Appeasement: Ancient Athens, Munich, and Obama's America (2011) is perhaps the leading expert on appeasement and other forms of political-military weakness. As the title of his book implies, he sees the Munich analogy as generally valid to understand Barack Obama; now, in an essay titled "The Lessons of Munich," he specifically applies the analogy to the Joint Plan of Action. He begins by looking at the role of analogy, pointing to the importance of American successes in transforming Germany, Japan, and the Soviet Union "from aggressive tyrannies into peaceful democracies" to argue for wars in Iraq and Afghanistan. He also notes the mistakes in his analogy. A people who have lost the confidence in the goodness of their way of life will not be saved by the material superiority of arms or money. And, as Munich also shows, that failure of nerve will not be mitigated by diplomatic negotiations. Talking to an enemy bent on aggression will only buy him time for achieving his aims. Thus Munich exposes the fallacy of diplomatic engagement that periodically has compromised Western foreign policy. Rather than a means of avoiding the unavoidable brutal costs of conflict, diplomatic words often create the illusion of action, while in reality avoiding the necessary military deeds. For diplomacy to work, the enemy must believe that his opponent will use punishing force to back up the agreement. This truth gives force to the Munich analogy when applied to diplomacy with Iran. Hitler correctly judged that what he called the "little worms" of Munich, France and England, would not use such force, and were only looking for a politically palatable way to avoid a war. Similarly today, the mullahs in Iran are confident that America will not use force to stop the nuclear weapons program. Iran's leaders are shrewd enough to understand that the Obama administration needs a diplomatic fig leaf to hide its capitulation to their nuclear ambitions, given his doubts about the rightness of America's global dominance, and the war-weariness evident among the American people. What makes Munich a useful historical analogy, ultimately, are the lessons it teaches about "the collapse of national morale and the risky reliance on words rather than deeds."